If you use a Facebook profile (rather than a Facebook page) for “you” as a Dreamspinner Press author, you can still enable readers to follow you. This will allow them to get your updates in their News feed without you adding them as a “friend”. 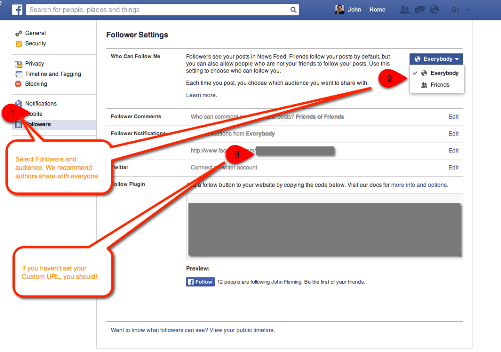 To enable people to follow you, first go to the Facebook settings (arrow at the top right). Once you enable followers, you will see the options below. If your profile is your “public” author profile, you should let everyone follow. You can also set who can comment and when you get notifications. If you haven’t set a custom URL (your name), you should! Once enabled, a “Follow” button will display on your profile.